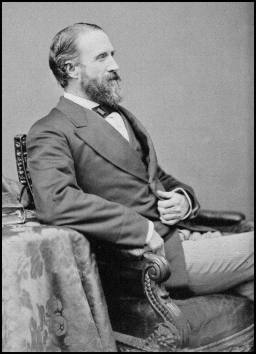 Giles Alexander Smith, a brother of General Morgan L. Smith, was born in Jefferson County, New York on September 29, 1829. When he was about eighteen years old he moved to Ohio, living first in London and later engaging in business for about ten years in Cincinnati. He next moved to Bloomington, Illinois, where he was occupied as proprietor of a hotel at the outbreak of the Civil War. 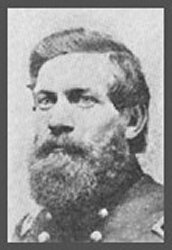 On June 14, 1861, he became captain of a company of the 8th Missouri Infantry, a regiment of which his brother was colonel. His first action was at the capture of Fort Donelson where he was commended in the report of his major. He was in some of the heaviest fighting at Shiloh, took part in the advance on Corinth, and succeeded his brother as colonel in June, 1862. In the attack on Chickasaw Bluffs in December and the capture of Arkansas Post in January, 1863, he commanded a brigade, first in the XII Corps and then in the XV Corps. Giles Smith served throughout the ensuing Vicksburg campaign and the subsequent expulsion of Joseph E. Johnston from Jackson; he was made a brigadier general of volunteers to rank from August 4, 1863. During the Chattanooga campaign, he was severely wounded in the course of W. T. Sherman's assault on the north end of Missionary Ridge. In the Atlanta campaign, he was assigned to command a division of the XVII Corps, and at the battle of Atlanta sustained William J. Hardee's assault on the Union left --- an assault which came within a hair's breadth of rolling up James B. McPherson's entire command. Giles Smith was brevetted major general of volunteers on September 1, 1864, and then led his division in the "March to the Sea" and throughout the campaign of the Carolinas. On November 24, 1865, he was advanced to the full rank of major general of volunteers, the last such appointment on the basis of seniority made in the Civil War. Mustered out in 1866, he returned to his home in Bloomington, Illinois. Giles Smith was an Illinois delegate to the Republican National Convention in 1868. He was appointed Second Assistant Postmaster General by President Grant in 1869, but resigned in 1872 because of failing health. He moved to California in 1874 in an attempt to improve his health, but returned to Bloomington, Illinois, two months before his death on November 5, 1876. Giles Smith was buried in Bloomington Cemetery.